Yet another installment of tentacles, this one exploring a couple of different techniques than the previous three. I got the paper itself damp this time before doing the greyish wash, and then dripped in a bit of colour here and there to add dimension to the grey. Then I washed again over the whole paper, which muted the bright white borders and caused some but not all of the wash to bleed around the body of the image. Since the paper’s recycled, there’s also a bit of colour bleed-through from the inkjet printing on the back, which is covered by the darkest part of the wash but still adds some depth. 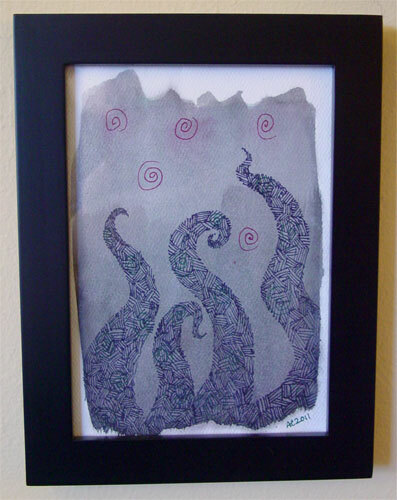 Then, once it was dry, instead of painting in the tentacles, I got out a blue-black pen and used obsessive crosshatching to create them. 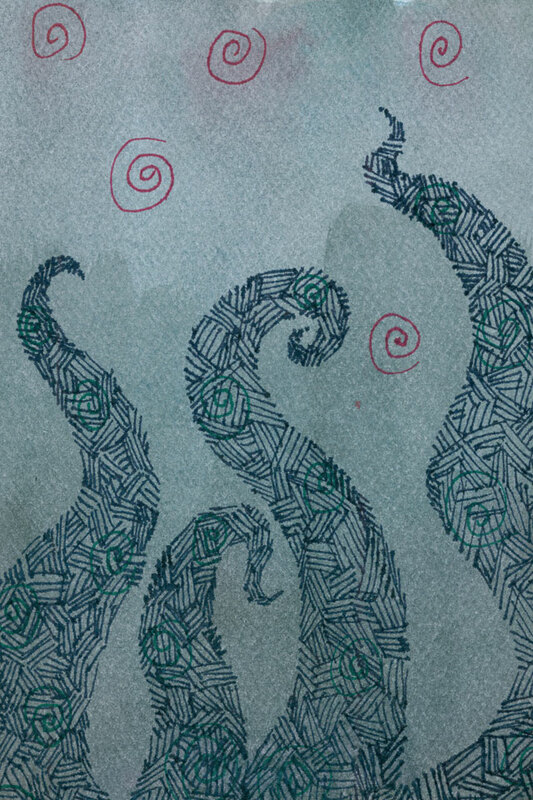 It’s always interesting and rather haphazard to create shapes like this freehand out of texture, without the comfort of penciling things in first, so the tentacles seem a bit less graceful to me this time around, and there’s no second or third layer of faded background shapes. 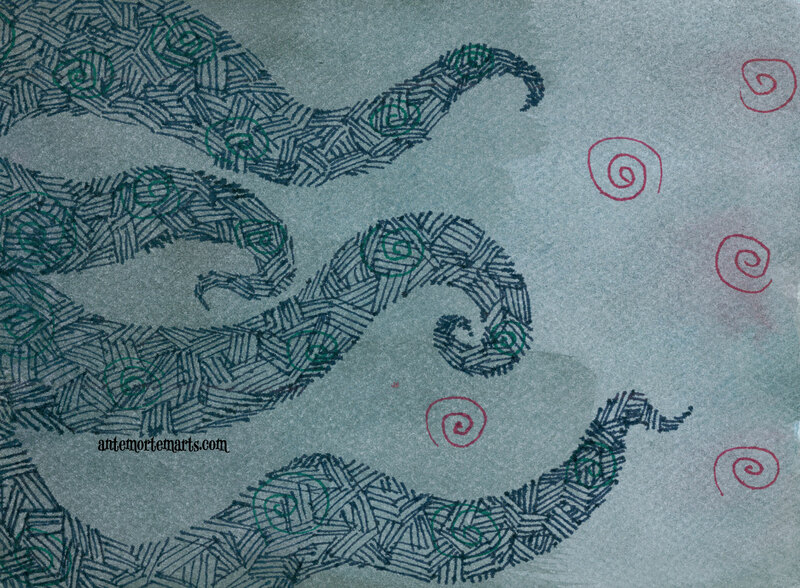 Instead, I used a dark red to highlight the red blotches in the wash, and then slipped dark green spirals subtly into the tentacle shapes themselves — you can click on the image to see it bigger, which lets you really see all the details. 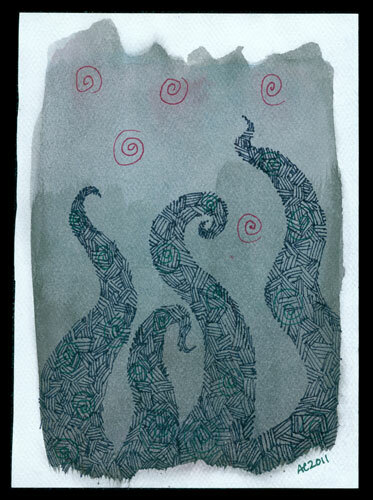 Tentacle Deeps 4, 5″x7″ ink and watercolor on watercolor paper.